Written by Eoin Colfer, don't know if it follows any of the 'Dave' story Douglas Admas was working on, but will make my trilogy and my daughters 5 in 1 need refreshing. Last edited by wobbly Jelly; 07-10-2009 at 13:02.
yeah am a little torn.. I though book 5 (in the increasingly inaccurate trilogy of 4) had an air of finality about it. I felt DNA had been pressured by fans and publishers alike (if he was or not I don't know.. it's just the feeling I got) as the book felt kind of like "Fine! you want another book? well here you are! now **** off!!" Having just read the fifth in the trilogy (after reading the other four of course), I'd say that that was that... a sixth seems a little pointless to me. Should let it rest IMHO (it's not as if the last 2 books were much good anyway). Last edited by General Zod; 07-10-2009 at 15:47. I've read an interview with him where he said that he was in a 'bad place' when he wrote book five and he really wasn't happy with it. He intended to re-address this himself. Personally, I don't want to read a Hitchhikers book that's not written by him, and I found they got increasingly depressing and downbeat as it went on. I think he should have quit at 3. If anyone could write part 6, it would be Stephen Fry and as its not him, I'll probably give it a miss. I've read some extracts over the weekend and there's something missing. Radio 4 have this as their book at bedtime starting from tomorrow, 22:45 for 15 minutes. read by Stephen Mangan, with Peter Serafinowicz. Oh, I might have a listen if it ends up on Iplayer. Ta. Last edited by KRW; 11-10-2009 at 22:56. True and can you let me know what the radio happy ending was? When faced with a certain-death situation, the Babel Fish has the ability to escape by teleporting itself and it's host somewhere else. As a result, Arthur and co end up at the Restaurant at the End of the Universe, where they find Zaphod and Marvin again (who's been rebuilt as his warranty hadn't expired yet), the two Trillians merge, and Arthur is reunited with Fenchurch, who's been working there as a waitress. The scene ends with Arthur asking Fenchurch if she'll go flying with him again, and she says 'always'. Last edited by General Zod; 12-10-2009 at 12:36. That's a really nice ending. Well have finished book 6 of 3.. "And another thing"
It's not a bad book and has some real Douglas Adam moments. However it's a bit like wanting a Triple chocolate muffin and getting a plain muffin with chocolate chunks. You take a bite... and instead of being full on chocolate you get something that's quite pleasant and a nice chocolate chunk every now and again and it's like "oh! a chocolatey bit!" It's only about £8 at Amazon at the moment. On a crowded commuter train, try reading the bit about ZB's roundhouse kick to the head, and stifling tears of laughter in an attempt not to draw attention to yourself. 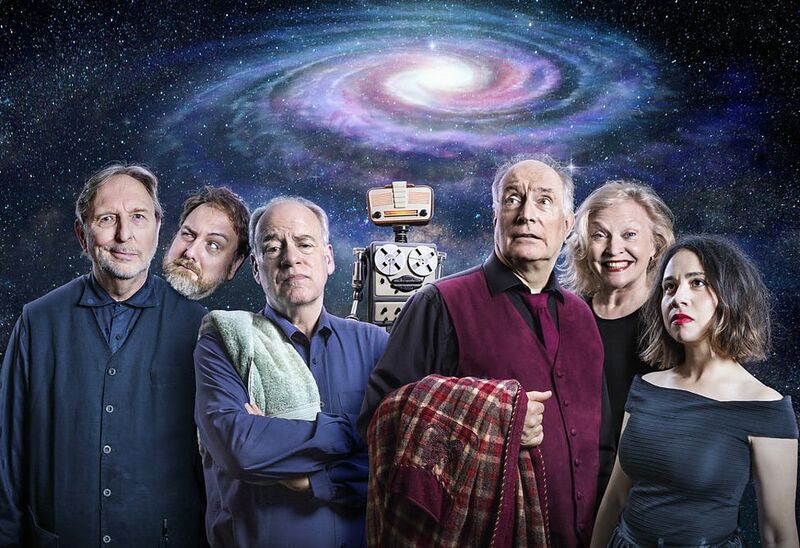 The recording at the end of the Universe - Rounding out the Hitchhiker's Guide to the Galaxy is the Hexagonal Phase, the sixth series in the 'trilogy'. 13 years since the Quintessential Phase hit the airwaves and 40 since the original landmark series was broadcast on Radio 4, the cast explain how it feels to be reunited a lifetime later. Been listening to it, don't think its that good myself, not up to Adams standards, however nice its still the same cast, theme tune etc. Thank you for this, just managed to er 'get' this from iPlayer before it disappears tomorrow.. had forgotten all about the 6th book (which I haven't read) so look forward to listening to this. Galaxy:, guide, Hitchhiker’s, Part, Six??? ?